Somehow this post from way back in June never made it to the Field Guide. I’m happy to find it and share it now. Here’s a fun Google mash-up for cyclists in NYC: ridethecity.com. I wish this existed back when I rode in NYC. The route ridethecity.com proposes as “safest” looks better than the route I regularly took to work, albeit a few blocks longer. But I’ll generally choose to ride farther if it’s safer/more pleasant/more fun. I love the indications for bike shops on the map and the distinction between roads, bike paths, greenways, etc. I also like the simple weather report in the upper right corner (though a windspeed indicator would be a welcome addition). Let’s hope ridethecity shares their work with other cities. I’d love to see more of them. Here are a few more photos from the LEMUR show courtesy of Nicole Peyrafitte. 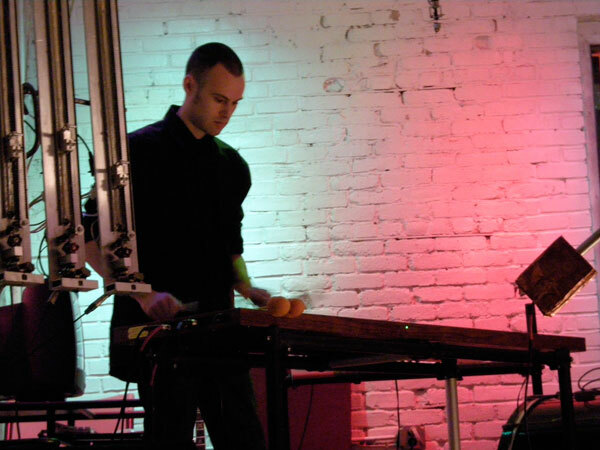 Max Lord playing the Marimba Lumina with the LEMUR’s GuitarBot on the left. Max Lord, percussion (in the mirror) and Ellen Godena, dancer with LEMUR’s ModBots on the ceiling. Here’s a video from my recent performance at LEMUR. It’s the first outing for this brand new piece, complete with all the hesitations, misfires, fuzziness and fun of a premiere. I’m pleased to have been chosen for a residency at LEMUR in Brooklyn for the month of February. Other artists-in-residence include Zach Layton and Max Lord. We’ll be presenting our work at the end of the month. Look for more information soon. The official announcement is below. Holland Hopson is a composer, improviser, and electronic artist. 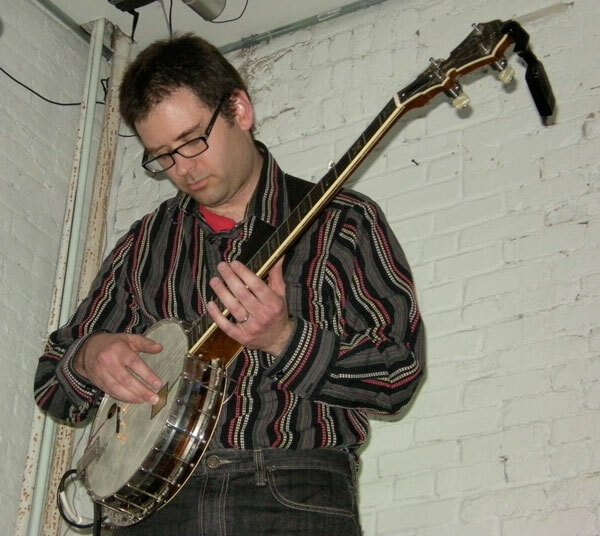 Holland will bring Old-Time Appalachia to the League of Electronic Musical Urban Robots by creating new pieces for the LEMURbots and Tru One, his clawhammer banjo/sensor interface. Zach Layton is a composer, improviser, curator and new media artist based in new york with an interest in biofeedback, generative algorithms, experimental music, biomimicry and contemporary architectural practice. His work investigates complex relationships and topologies created through the interaction of simple core elements like sine waves, minimal surfaces and kinetic visual patterns. He is planning to create a new work for guitar, sax, drums plus robots. The piece will be composed using an open score format encouraging improvisation among the human players and neural network software to encourage improvisation among the robots. Max Lord is a percussionist who will be writing a new piece for the LEMUR robots in collaboration with NYC-based choreographer Ellen Godena. The score will integrate a live performance on the Marimba Lumina with robot percussion and spontaneous robot-inspired movement. Artists from all performing and installation disciplines are encouraged to apply to ReSiDeNt, including musicians, composers, dancers, choreographers, video artists, interactive installation artists, performance artists, multimedia artists and others. To learn about applying to ReSiDeNt, visit http://lemurbots.org/resident.html. Deadlines are rolling, with March submissions accepted until February 18th.